First one had to be returned due to flip up not locking properly. Replacement is fine, although the locking mechanism doesn't feel as positive as my previous one. I think it's a bit noisier than my old version, but it's a pretty good helmet for my needs and I like the versatility. Good helmet. Great for using it in the open position on a short journey and closed on long journey, bit fiddly when opening from full face to open face. Taken fly screen off as wind deflection on lid better. Had a series 2 before this and decided to upgrade to the 3, Shark have improved the comfort and the noise reduction on this edition and have some cracking paint jobs to choose from. The price is value for money for what you get in comparison to some of the more expensive brands. This is a lovely comfy helmet which is stylish as well. I love the chin bar up or down, in other helmets my chin and sometimes my nose can be up against the chin bar where as in this helmet I have no such problems. I don't suffer from the noise problems probably because of my screen so cant comment there but I always wear ear protection. Being new the visor is brilliant, I can't tell whether it is up or down!! 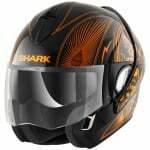 Brilliant helmet, light and versatile. Great value helmet. Bought as a replacement for a Evoline 2 that went down the road. 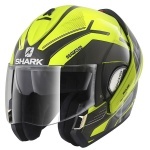 Tried a number of other lids, but the only other one that would fit my head shape was the Shoei at £150 extra. The difference between this and the Evo 2 is very much noticeable - although only a couple of hundred grams lighter on paper, you can really feel this. Highly recommended. I've got a Evoline 1 and like that so tried the Evoline 3, which has been improved. A lot lighter, also like the chin bar opens the visor at the same time, much easier to use. Got this as a Christmas present and was blown away when I opened the box, still have a grin on my face 4 days later. Anyhow the helmet fits great on my XL head and is comfy visibility is good and peripheral vision is good, wind noise when visor is up isn't to bad and helmet is very quiet when it's down. Not had a chance to use the sun visor due to rubbish weather but have tried it and it will be very welcome on sunny days, the design of the helmet is first class the flip up can be left up and you can use as an open face if you prefer and the graphics match the rest of the design, if you have the chin piece in place it doesn't look like a flip lid at all, the chin piece can be moved with one hand when needed, the chin strap is cool and can easily be adjusted, finally if I was selfish I would say don't buy this helmet as I want to be individual, BUT I'm not selfish so go and buy it, you won't be disappointed. Sportsbikeshop were excellent in their customer service and price matched for me, the packaging and quick delivery are second to none, will definitely go to them again. This is a superb concept, with the fly up and round chin bar, which allows open face riding with or without visor. I did have to send it back though because for me at least I found it too heavy. I weighed my Medium at 1850g (including all the bits you can't take off in case you do send it back so probably 1800 without). I also felt the balance was out and with the chin bar down it pulled my head forward and with it up it pulled it back, making the weight more intolerable. I also started to get a headache after sitting with it on for about 20 mins so although it felt fine on my head something wasn't working for me. I'm used to a Medium Shoei for comparison and find them spot on for my head. The helmet seems well made and the mechanisms work well. Reluctantly I had to return mine for the above reasons but if the weight doesn't bother you this would make an excellent lid if you fancy the flexibility. Not had a chance to try it yet but out of the box it looks very well made, the fit is good and there is plenty of padding. I have worn Flip front helmets for years as I like to have the choice of riding open or closed face so this should really suit my style of riding. The product is brilliantly designed and it a good fit. The flip up bit make it easier so I don't have to keep taking it off to eat or smoke, it's very useful. It's quite comfortable and has a lot of padding. Thank you so much, I'm glad I brought this product, will definitely buying more products from you. Very quick delivery and well packed. Fantastic design. I purchased this for a motorcycle holiday road trip in South Africa so to date I haven't had it on in anger. It's a snug fit, but not to tight for my glasses. My other flip seems to be loose in comparison. I will update my opinion on my return. Plenty of padding and a snug fit. Option to return in same box if unhappy which was reassuring. Most importantly the SRNA 20S was an easy fit. Love the flip over part. The helmet arrived in good time albeit not the next working day advertised. Well packaged in an outer box and Sharks on box and bag on the inside!! It feels like a quality product! I haven't had a chance to get out and ride in it yet but looking forward to it!!! Great addition to my helmet collection and exactly what I wanted. It is a full face when required, and the chin bar flips up and over out of the way safely when not in use, and gives exceptional visibility when in traffic. Cheek pads a little tighter than previous helmets, but one of my better purchases. Thanks for great service too. 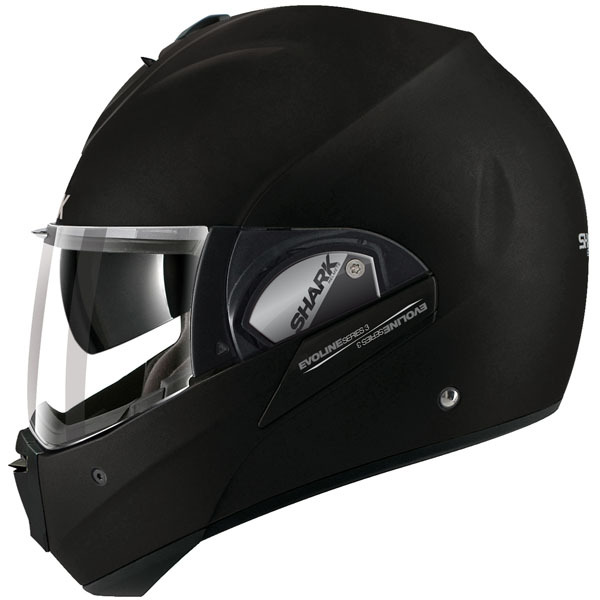 This helmet is great for sunny warm days and wet weather all in one. No more getting caught out with open face in rain just pull chin guard down and ride on. On the face of it, this is a beautiful looking crash helmet and with the chin bar in the open face position it does everything you expect from an open face helmet. The inter grated sun visor is a life saver too. The comfort is better than any crash helmet I have ever tried. Unfortunately living in the U.K. It is infrequent where I can use in with the chin bar up, and here's where the problems start. With the chin bar down I get a very loud high pitch whistling in my right ear every time I reach 40 mph. Ironically it is noisier with the chin bar down than up. This has seriously tainted the helmet for me, despite trying lots of things I have been unable to solve the whistling issue so it looks like I'm going to have to buy another helmet for inclement weather conditions.